Disparate to an older child’s bedroom, a new-born baby’s nursery is a room routinely visited as a parent during your child’s early years. As well as being soothing for your baby – and relaxing for Mother and Father – your nursery should act as a playful fun space for when they begin to toddle around. Who says a baby’s nursery must be blue or pink? Introduce neutral colour schemes, such as white, and add bursts of colour and texture to both soothe and stimulate your newborn. 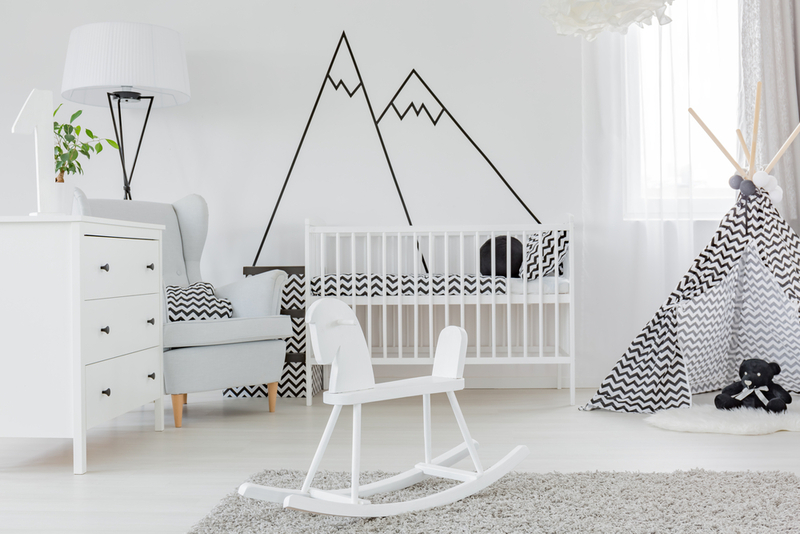 Characterised by simplicity, minimalism and functionality, the Scandinavian theme is perfect for your child’s nursery (also great if you want to sell your house fast as a survey has revealed that 62% of people prefer a neutral palette when buying a home!). This monochrome nursery room may not be bold in colour, but its highly texturised materials complement the uncomplicated colour scheme, creating a fun environment for your son or daughter to sleep in and play in once they grow. Introduce a statement, fluffy-texture rug with colour co-ordinating accents for a room fit for a modern little boy or girl. 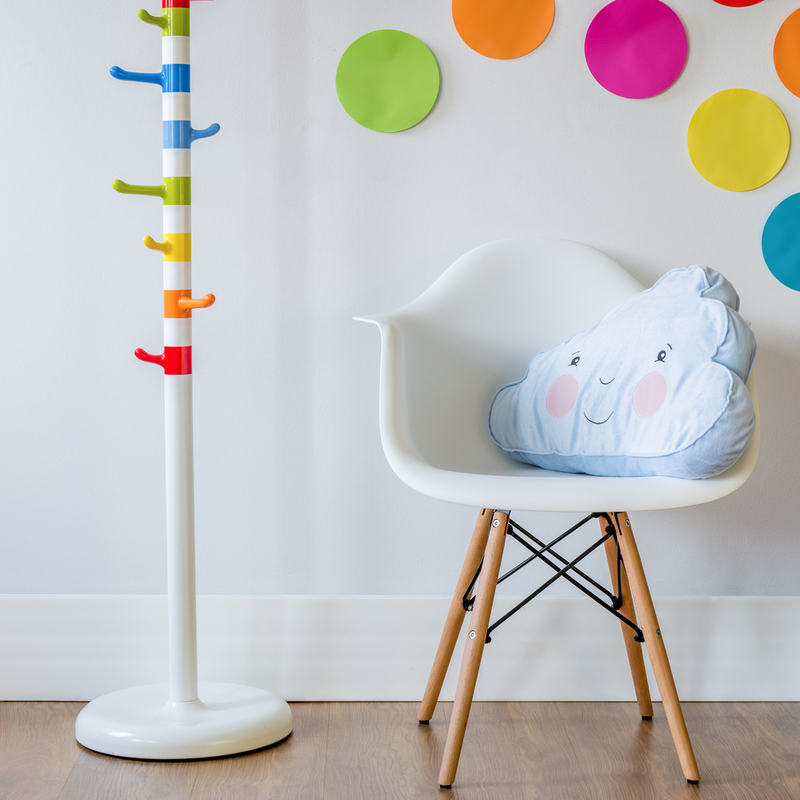 Pastels are a popular choice among parents when decorating their new-born’s nursery. Pam Ginocchio, co-founder of Project Nursery, agrees: “When you think ‘nursery’ and ‘baby’, it’s a natural fit to think pastel”. Green and yellow hues are a stylish, gender neutral colour combination for anyone who’s looking for an alternative to pinks and blues. A study published in the Personality and Social Psychology Bulletin, green is said to be a calming colour that promotes harmony and balance. Introduce colour through printed fabrics, such as cushions and curtains, and fun Scandinavian-inspired bunting. 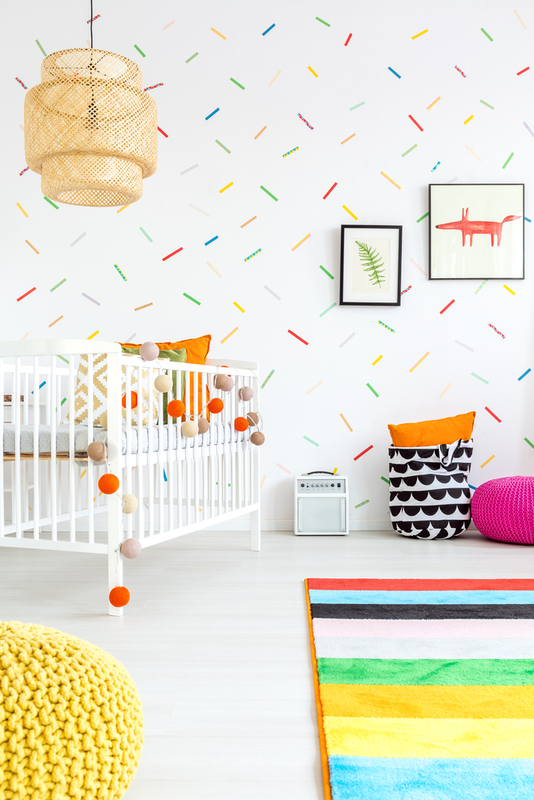 If you can’t resist colour and prints, but do not want to overwhelm your nursery, think about brightening the room up with a statement wall. Creating a feature wall is a contemporary design becoming increasingly popular in young children’s bedrooms. Substitute customary pinks and blues for gender neutral colours, such as orange, red, yellow and green, like this ‘confetti’ style rainbow wall with complimentary accents. Incorporating animals and nature-inspired wall murals to your nursery provides an exciting alternative to otherwise popular pastel hues. 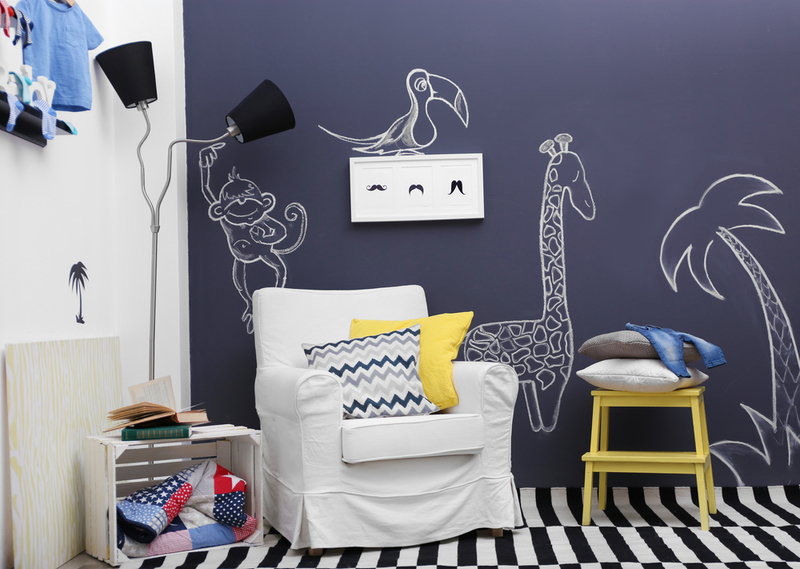 This nursery features a simplistic zoo theme containing a hand-drawn monkey, giraffe and toucan. Touches of yellow accents add a contrast to the striped rug under foot to create unisex appeal – a fashionable Scandinavian attribute that has travelled to the UK in recent years. Such a subtle scheme would suit both boys and girls alike, and colourful elements can easily be integrated (and swapped around) for your growing child. 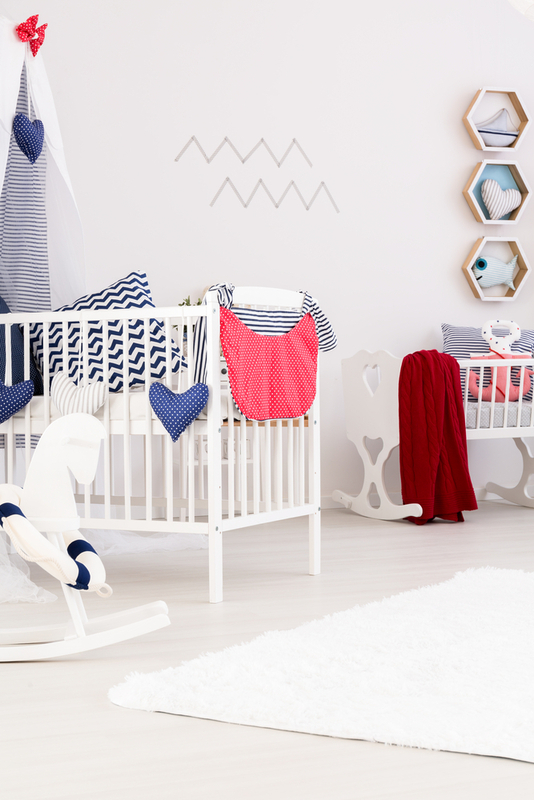 If you want to create a warm and inviting space, white can sometimes feel too sterile, especially for a baby’s nursery. Choose neutral colour palettes that harmonise with each other, but relax and soothe both baby and parents. Duck egg blue is ideal as it adds interest to a room without being too overpowering and complements perfectly with calming greys. Additionally, the nautical theme is a great choice for adding character and colour to your child’s nursery (pictured), without being too dramatic in terms of colour. Get your craft on and use stencils and create shape-inspired mobiles for your baby to enjoy whilst laying in their cot. Geometric shapes are easy to create and combine with a variety of patterns and textures, such as rugs, curtains and cushions. Although, it’s important to not be too busy – use a white colour scheme and add vibrancy through 2D décor. Wall murals, like the multi-coloured dots pictured, are easy to create and cheap to buy. What sort of neutral nursery would you go for?